Swann - Advanced Security Made Easy! Swann's products are mainly do-it-yourself (DIY) with easy-to-follow 'plug-and-play' instructions, full after-sale technical support and retail-friendly product packaging aimed at home, office and small-to-medium retail users. 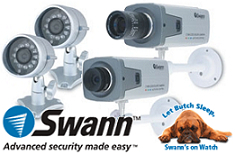 For customers needing more high-tech solutions, Swann is at the forefront of the latest international trends including wireless connectivity, professional quality CCTV cameras with infrared night vision, digital video recording with motion detection and networkability, web surveillance and remote notification. All prices shown on techtronics.com.au website are in $AUD and inclusive of GST. Prices and availability are subject to change without prior notice. Images displayed are accurate to the best of our knowledge and we will not be held responsible for purchases based soley on these images. All brands and names are trademarks of their respective companies. We sell and ship to anywhere in Australia . © Techbuy Pty Lts t/as Techtronics (techtronics.com.au) 2019 All rights reserved. (site rev. 1.5) For more information, please see our usage policies.